Stephen Edelstein November 18, 2013 Comment Now! 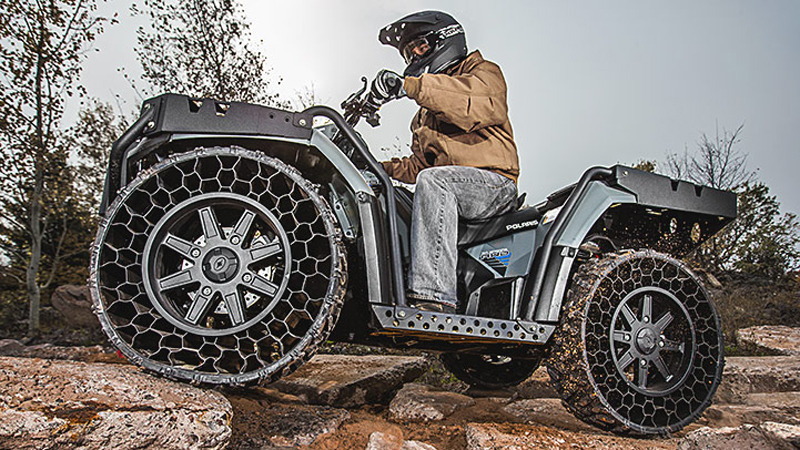 Polaris has finally put airless tires on sale. 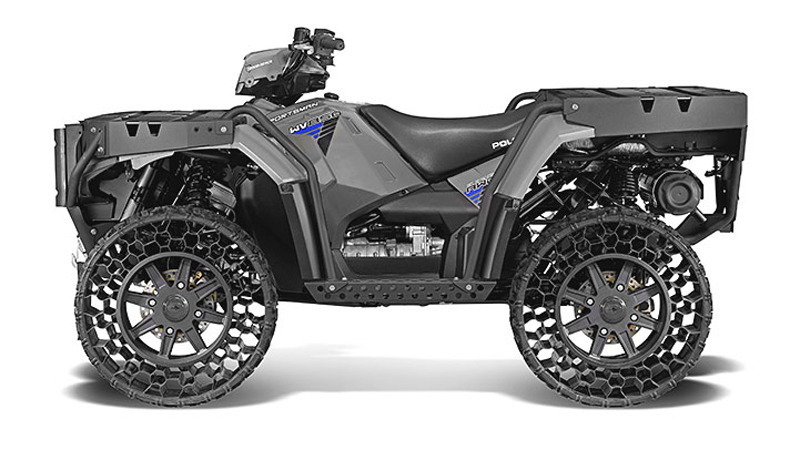 The Polaris Sportsman WV850 H.O. ATV is the first vehicle to offer them and, considering that it's inspired by the MV850 military ATV, that seems appropriate. They pretty much make it the ultimate post-apocalyptic four-wheeler. 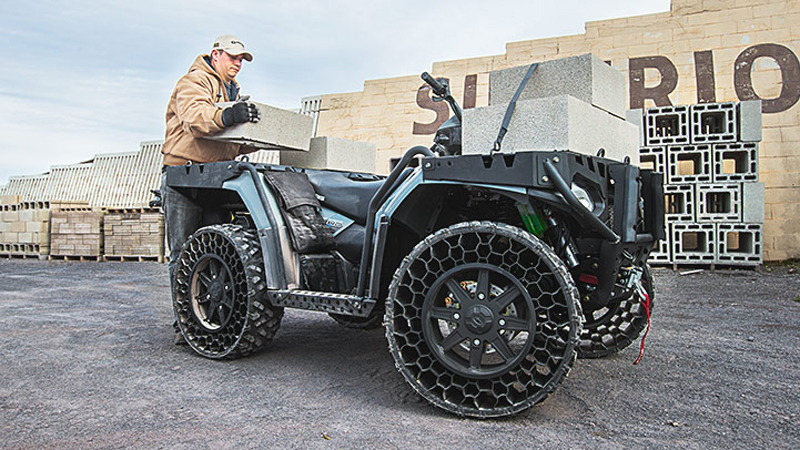 According to Polaris, the TerrainArmor tires, can take a direct hit from a .50-caliber round and still drive 350 miles; they can also last 1,000 miles after running over a railroad spike. How do they do it? The tires' inner structure is a mesh design that supports the weight of the vehicle, while still being flexible enough to soak up bumps. There's still a rubber outer tread so, like conventional tires, different tread patterns can be developed for different applications. In addition to not ever needing a trip to the gas station's air pump, the TerrainArmor tires are reportedly less wasteful, because only the outer tread section needs to be replaced. They also offer a more comfortable ride and reduce noise, according to Polaris. 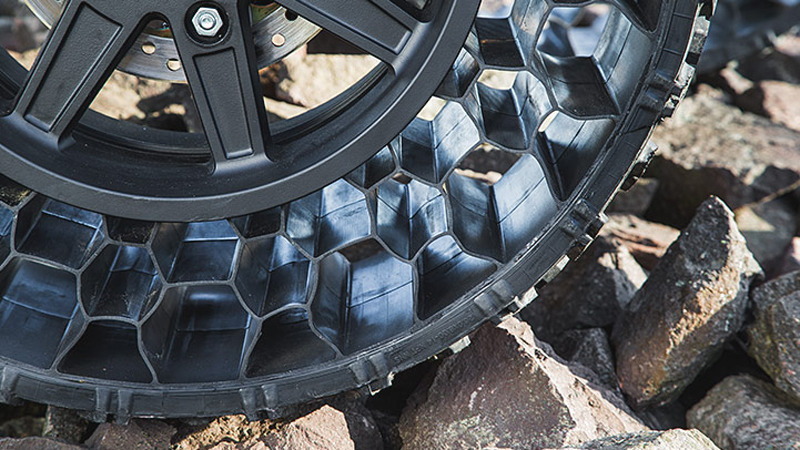 The airless tire was actually developed by Resilient Technologies, a Wisconsin startup Polaris acquired last year, presumably for this tire tech. The Polaris Sportsman WV850 H.O. goes on sale next month with a starting price of $14,999, but only in "very limited quantities." 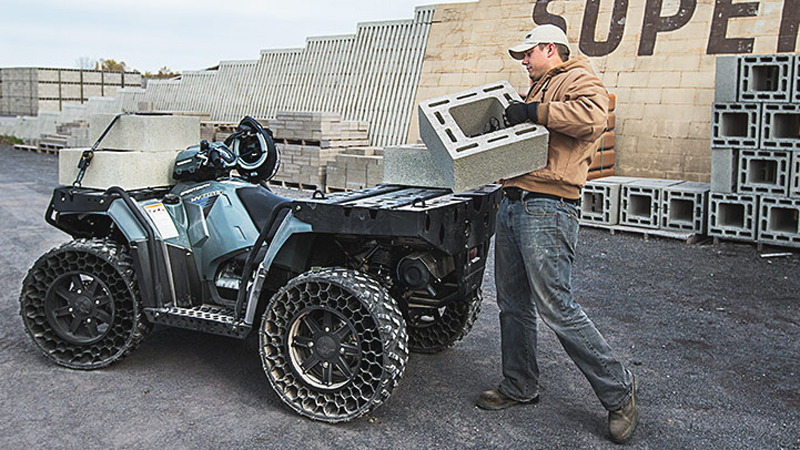 Other features include a steel exoskeleton chassis, and a 1,500-pound towing capacity. Drivers looking to put airless tires on their cars might have to wait a little longer, though. Michelin introduced the concept of the airless tire with the "Tweel" in 2005, and both Bridgestone and Hankook have subsequently unveiled their own version of the concept. However, none of these automotive airless tires have been put on sale yet. High-Res Gallery: Polaris Sportsman WV850 H.O. with airless tires.